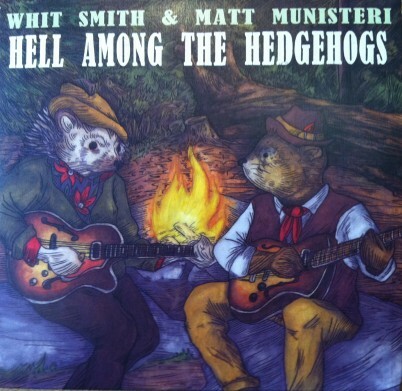 The new CD by Whit Smith, Matt Munisteri, and Tim Luntzel, HELL AMONG THE HEDGEHOGS is a delight, so varied and lively, that I have found myself playing it twice in a row, enjoying it more each time. Some of you will be ready to order it right now — so why should I burden you with details? You can accomplish that goal right here or (if you feel Amazonian) here — or if you like all things Baby, then here. I always think that the absolute best way, should you want a tangible disc, is to buy it from the artist at a gig — doubling your pleasure and the artist’s — but I know that isn’t convenient for everyone. Whit and Matt, peerless guitarists, romp on “two old Gibson electric guitars,” with their distinctive sound — and are joined by the fine string bassist Tim Luntzel. The sessions were recorded in 2010, and they sound real, with no studio trickery or tension. The final track comes from a live session at Barbes in Brooklyn — and has some impromptu crowd support, as is appropriate. Now we can move on, having cleared that up. The sound of the three string instruments suggests — at turns — shirt-sleeved daredevils on the shady porch, creating new paths through familiar melodies, taking their time. At times a ringing phrase suggests Bix or Louis, George Barnes or Chet Atkins — or the local train meandering through the history of intimate swing playing of the last ninety years. You’ll hear a barn dance and a Harlem jam session of 1941. Nothing drags or races; everyone explores the open vistas of rocking Medium Tempos in light-hearted ways. Whit sings ALONG THE NAVAJO TRAIL; Matt offers SINGIN’ THE BLUES with the never-heard verse. Those two selections will indicate the wide range of the nine songs: from obscure pop songs to hokum to jazz classics to one by Eldon Shamblin and Tiny Moore, YOU JUST TAKE HER. The songs show a deep immersion in the jazz tradition — MUSKRAT RAMBLE, DEEP HENDERSON, a Coleman Hawkins line, TOO MUCH OF A GOOD THING; a Sidney Bechet tune, OKEY DOKE. But don’t think that this CD is jazz archaeology, dusty jazz idolatries. Certainly not. The classic lines are used as foundations for energetic, joyous playing. The title track — an original by Whit — is a left-handed consideration of STRUTTIN’ WITH SOME BARBECUE (to my ears) full of surprises. And no CD that ends with YOU’RE BOUND TO LOOK LIKE A MONKEY WHEN YOU GROW OLD (one of those tough truths no one wants to hear) can be overly serious, can it? I never cared much for muskrats and hedgehogs before this, but I’ve changed my mind. You will, too.